If your bottle has anything other dash 4, M8 or M10 please let us know or bring with you a method of adapting your bottle outlet to dash 4 male otherwise we will be unable to fill your bottle for you. Please note we will strictly only fill Nitrous bottles for use in motor vehicles, and reserve the right to decline refilling any bottle which we deem to be unsafe. All bottles must be collected in person. We cannot ship bottles after they have been filled. What is NOS / Nitrous Oxide? For the purposes of automotive use, Nitrous Oxide when in its desired state of compressed liquid can be thought of as an extremely dense form of oxygen. Nitrous oxide molecules consist of 2 atoms of nitrogen bonded to 1 atom of oxygen. By weight it is 36% oxygen, whereas the oxygen content in air is only 23.6%. At 70° F it takes 760 PSI of vapour pressure to hold nitrous oxide in liquid form. When liquid nitrous is released from the pressure it's contained at in a bottle, it drops from 760 PSI + to 14.7 PSI (normal atmospheric pressure), very quickly and in the process it boils and rapidly expands, resulting in a substantial temperature drop as nitrous boils at 129.1°F below zero. Cooler intake air is denser and therefore contains more oxygen, which will allow more fuel to be burned and in turn make more power. Just a 10 degree drop in temperature has the potential to increase an engines power by up to 1.5%. Nitrous oxide boils at -129°F and it begins to do that as soon as it’s injected into the intake manifold. To boil, the nitrous has to absorb heat from the intake charge and in so doing has the potential to reduce the intake air temperature by up to 80°, which means that if we were dealing with say a 400 hp engine, we could see a gain of over 30 hp from the cooling effect alone and as a bonus, this cooling effect also helps the engine stay below the detonation threshold. To achieve such a good cooliing effect the nitrous must be injected as a liquid. Only The Wizards of NOS 'Street Blaster' nitrous systems are capable of injecting such dense liquid as to take maximum advantage of this effect. Activating a NOS nitrous oxide system adds nitrous oxide & fuel to the original inlet charge and although the nitrous oxide itself does not burn, it is an oxidiser which provides more oxygen to allow the additional fuel to be burned, and therefore produce more power. At 565 degrees F (less than the temperatures of normal combustion), the molecules of nitrous oxide break down, releasing the oxygen atoms from the nitrogen atoms. Once free from the nitrogen, the oxygen supports the combustion of the additional fuel, while the released nitrogen suppresses detonation. The increased amount of oxygen & fuel in the combustion chamber results in the assorted molecules being more tightly packed than normal, which leads to a quicker burn rate, that requires less timing advance for optimum results. 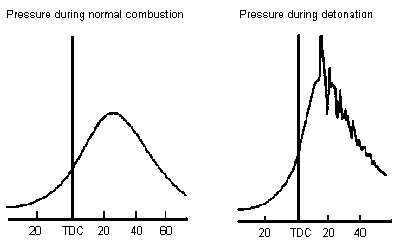 Without retarding the timing appropriately, the quicker burn rate would cause peak cylinder pressure to occur too soon and this would lead to detonation and engine damage. Up to a point, adding nitrous oxide to an engine will reduce the risk of detonation (especially on forced induction engines) but after that point when larger power increases are required it will increase the risk. One of the reasons for this is the extra heat generated and the easiest way to overcome this being a problem, is to add excess fuel which will act as a coolant. Wizards of NOS nitrous systems are supplied with rich jetting to give you a safe starting point, which means this issue is already dealt with to some extent and as long as an engine is not pushed to the extreme, running slightly richer should be all you'll need to control detonation. 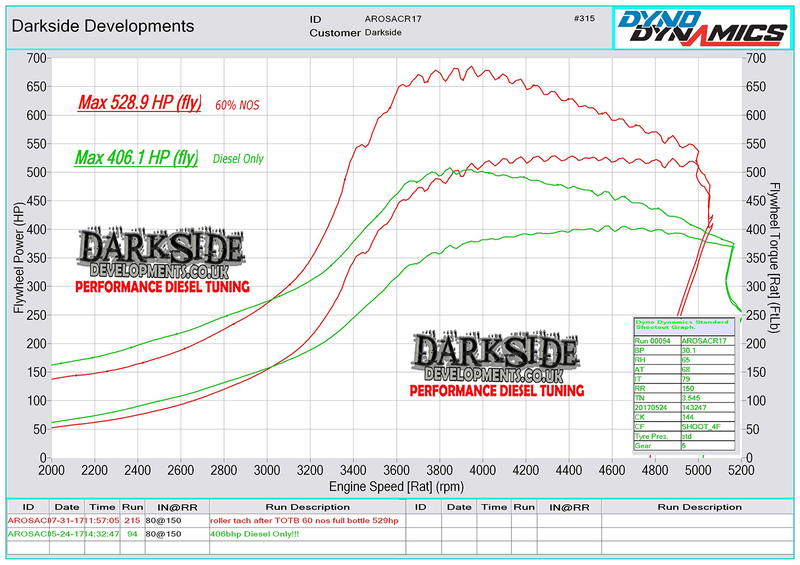 Whilst running richer than optimum will reduce the power output slightly, the advantage of raising the detonation limit will allow more nitrous to be used to get more power more safely. With all the above in mind, it is obviously essential to supply the engine with precise amounts of additional fuel to match the amount of nitrous oxide being added (to ensure the engine doesn’t run lean) and to retard the timing to an optimum setting, to achieve successful and reliable results. When all three (fuel, nitrous and timing) are controlled accurately, your engine can safely and reliably generate exceptional power increases without causing damage due to detonation. 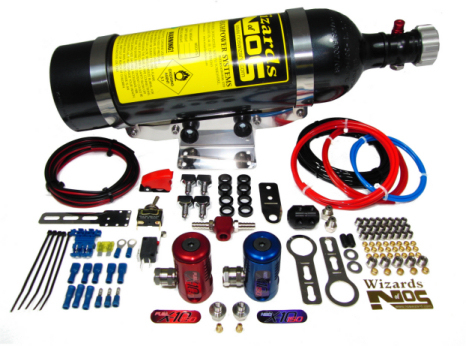 A well designed, Wizards of NOS nitrous system, which delivers an accurate amount of both nitrous and fuel and remains consistent in doing so, is vital for good performance and avoiding detonation. 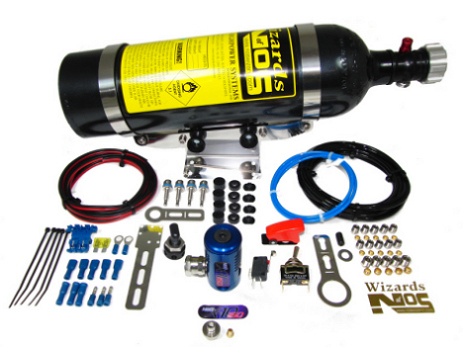 Wizards of NOS nitrous systems are designed in such a way to achieve this, as well as maintaining 100% reliability. A 'wet' nitrous system delivers nitrous and fuel under the control of the nitrous system. In contrast a 'dry' nitrous system only controls the delivery of the nitrous oxide, while the fuel is delivered via the existing fuel injection system by increasing either delivery pressure or by extending the injector open time. Single injector dry systems are sometimes referred to as 'dry manifold system' because the additional fuel does not pass through the manifold as it does with a single injector wet system.